Thyroid ultrasound examination allows detailed and accurate description of thyroid nodule features including nodule size, location, echotexture, echogenicity, margins, shape, presence and extent of cystic content, calcifications, and nodular flow pattern on Doppler study. The finding of a colloid signal, complete thin peripheral halo, or complete rim calcification makes thyroid nodule malignancy less likely, whereas nodule hypoechogenicity, microcalcifications, irregular margins, taller than wide shape, and interrupted rim calcification with extrusion of soft tissue are suggestive of malignancy. In contrast to papillary thyroid carcinoma, follicular thyroid carcinoma does not display microcalcifications or cystic content on ultrasound, often has a regular margin and may feature a peripheral halo. The role of ultrasound elastography and Doppler flow in distinguishing benign from malignant nodules remains to be determined. Importantly, no single ultrasound feature in isolation is predictive of nodule malignancy or benignancy, and the risk of malignancy is best characterised using a combination of ultrasound features. Two widely used thyroid malignancy risk stratification systems are the American Thyroid Association and the European Thyroid Imaging Reporting and Data System. 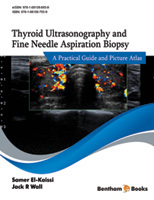 These classification systems improve the sensitivity of ultrasound for the detection of thyroid malignancy without compromising its specificity and allow the recommendation of nodule size cut-offs for FNA biopsy.